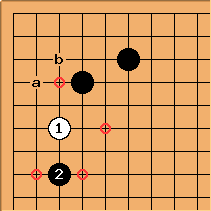 This enclosure, a small knight's move enclosure from a 4-4 point, is in frequent use in contemporary go. 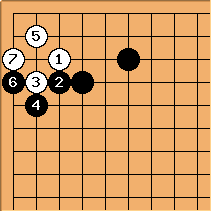 It emphasizes territory more than the large knight's move 4-4 7-3 enclosure does. The prime reason for saying that is the fate of the 3-3 invasion . The 3-3 invasion here becomes ko in this main variation; though that's not the whole story. See 4-4 6-3 enclosure, 3-3 invasion for more information. 4-4 6-3 enclosure second-line diagonal attachment is a position that occurs both with the 2-4 and 2-5 approaches. 4-4 6-3 enclosure 3-4 contact. Black's answer's at a and b both leave a little to be desired, so may (if well-timed) successfully prevent Black building a framework on a large scale here. Naturally, if Black intends to build in the centre, it would be more consistent to make the initial enclosure with a fourth line play, such as the 4-4 6-4 enclosure and the 4-4 7-4 enclosure). 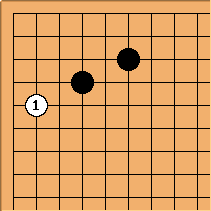 White may also simply play the ordinary approach move, setting up a tenuki joseki position. There are a number of ways for Black to play, depending of course on the whole framework. This diagonal attachment has its own discussion at 4-4 point low approach low extension, tenuki. 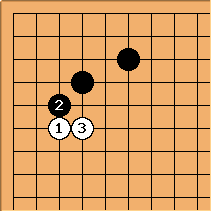 After played as a pincer the exchange White a - Black b doesn't give White a proper base, so White is somewhat heavy here (position discussed at 4-4 point low approach low extension, slide, pincer, tenuki). Therefore White normally plays at one of the circled points. 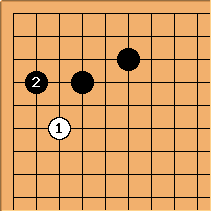 In other circumstances the footsweep is designed to attack White's base on the outside while taking the corner. 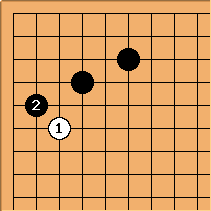 Black may simply opt to take the corner with here. Later, and Endgame Tesuji 4 may be relevant followups. If the direction of play is to favour the upper side, Black may also play at a or b.